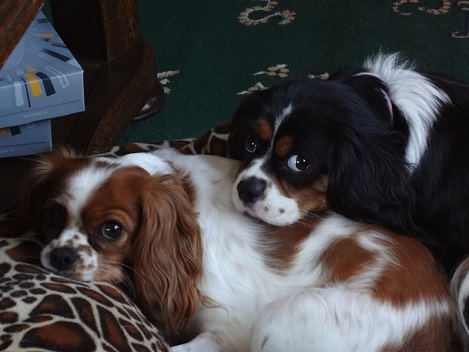 Hello and welcome to this website introducing you to the life of Katy and Bess, my two Cavalier King Charles spaniels. Katy is a blenheim born on the 17 May 2013. Bess is a tricolor, born on 9th July 2013. Follow their life story and pictures on this website, and watch the years unfold. This website will also include other subjects that touch or have touched on this families life and help to keep memories alive. From past pets to insects, hobbies and holidays enjoy reading this website. Katy and Bess currently live with 2 male canaries, a load of ants in formicariums, and stick insects. They enjoy their walks and seeing new things, but best of all meeting new people that will make a fuss of them. All together in 2014 waiting for a walk.